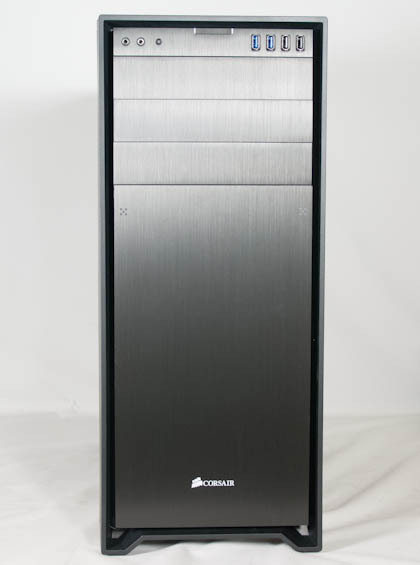 Corsair's case lineup has been growing over time with a trickle down approach, as they launched with the venerable (and expensive) Obsidian 800D and have been able to shrink all the way down to the Carbide 200R. Yet outside of the Obsidian 900D, their enthusiast high end (as opposed to the obscene beast that is the 900D) has actually remained relatively unchanged. Today the Obsidian 750D launches, covering the space the 700D and 800D used to occupy while trickling down the 900D's industrial design. The "lip" that was on the Graphite 600T has become a part of the ID for Corsair's new Obsidian cases, and I like it. Corsair has actually turned it into a fairly smart, useful design cue; there are no unsightly vents on the front fascia of the Obsidian 750D, but the large plate at the bottom is actually almost totally ventilated in the surrounding area. It's a slick design. The black aluminum fascia suits the 750D and allows it to stand out even amongst other "black monolith" style enclosures. Corsair has also taken to using large square windows on the sides of their cases, and these sharp angles suit the rest of the ID well. Whoever is handling ID over there should be proud. The interior of the 750D is a pretty bog standard case design, but it sports all the usability I've come to expect from Corsair. Both 3.5" drive cages are removable (or stackable), and toolless 2.5" drive cages line the back off the case (one of mine was jostled slightly in shipment). Corsair has been experimenting both with doing away with 3.5" drives (the Carbide Air 540 only supports two) and toolless 2.5" drive mounting methods, but the fly in the ointment for the latter has been the increasing popularity of 7mm drives instead of 9.5mm ones. 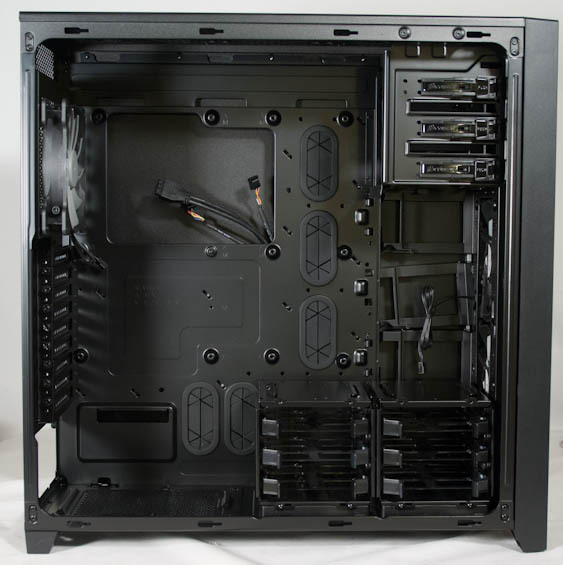 Air cooling is handled by a pair of 140mm intake fans and a 140mm exhaust fan; there's space to mount additional fans (or radiators) in the top of the 750D as well, and a large magnetic "sheet filter" is in place on the top of the case. Interestingly, Corsair has forgone including a fan controller with the 750D; instead, the 140mm fans are just tuned to what will hopefully be a happy medium. Internal 6x 2.5"/3.5", 4x 2.5"
Dimensions 21.5" x 9.3" x 22.1"
The Obsidian 750D is essentially hitting the mainstream of the high end. This is a fairly competitive market, and it behooves Corsair to have a strong entry at the $159 price point. 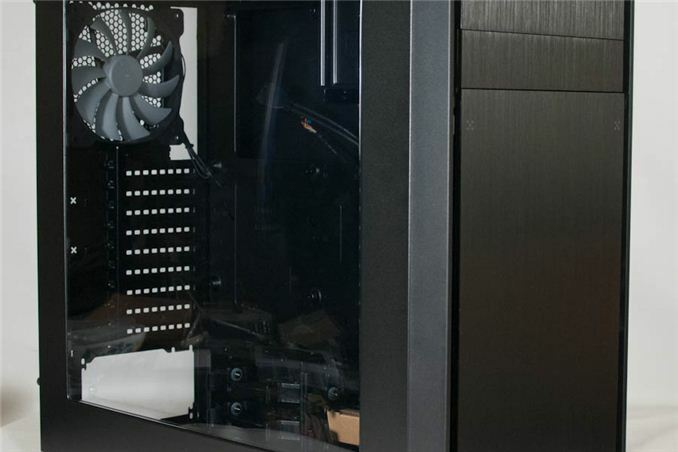 What's interesting is that while one of Corsair's main competitors, NZXT, is cramming their cases full of useful features, Corsair seems to be stripping them down to the essentials. The interior is primarily modular, sure, but there's no fan control, no acoustic padding, no funky LED lighting, nothing like that; this is a streamlined enclosure that seems to be heavily geared toward liquid cooling. That's fairly typical of modern Corsair designs; the 900D's entire reason for being is really to be a liquid cooled system, and the cumulative 1020mm of radiator support in the 750D should be fairly telling.